Our ciders are premium ciders produced using a second fermentation to produce the bubbles just as is done with our sparkling wines. Most hard ciders are carbonated and are not produced using a second fermentation. 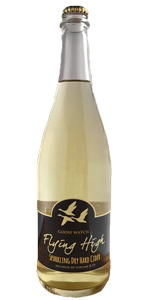 Our Flying High Dry Cider is Blended from 2/3 Pinova and 1/3 Northern Spy apple varieties. Double Gold Medal Winner!